NTRUHS MD Ayurveda,MD Homoeo courses Merit list, Admissions Counseling, Certificates verification Dates 2017, NTRUHS MD (Ayurveda)/ MD(Homoeo) 2017 Merit list - First & Final Admissions Counseling 2017, Certificates verification dates, List of documents for verification: Dr NTRUHS : http://ntruhs.ap.nic.in MD (Ayurveda)/ MD(Homoeo) 2017- First & Final Admissions Counseling 2017 notification: First and Final Counseling for admissions into MD (Ayurveda) & M.D. 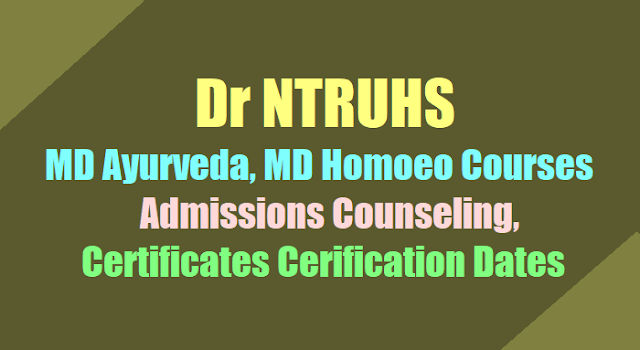 (Homoeo) courses, 2017-18 in the state of Andhra Pradesh under Dr. NTRUHS Counseling for exercising options for admission into MD(Ayurveda) and MD(Homoeo) courses for the Academic Year 2017-18 will be held from 09.00 A.M. at Dr. NTR University of Health Sciences, Vijayawada on the dates mentioned against each course. All the candidates whose names are figured in the merit list of Dr. NTR UHS to be displayed on 18.10.2017 are only eligible to attend Counseling for admission into MD (Ayurveda) and MD (Homoeo) courses for the academic year 2017-18. Seat Matrix for MD (Ayurveda) and MD (Homoeo) Courses separately for the academic year 2017-18 will be placed in the University website: http://ntruhs.ap.nic.in, one day before the counseling. All the selected candidates for admission into MD (Ayurveda) and M.D. (Homoeo) courses shall report to the Principal to the concerned on before i.e., 25.10.2017 along with all necessary relevant original certificates and shall pay the University registration fee of Rs.10,000/- (Rupees Ten thousand only) each. The fee shall be paid through Demand Draft drawn in favour of the Registrar, Dr. NTR University of Health Sciences, payable at Vijayawada. The fee once paid will not be refunded under any circumstances. Mere attending for the counselings does not confer any right for a seat. If necessary, candidates who will attend for counseling, have to stay for one more day. 1. Counseling for exercising options and selections for M.D. (Ayu) Course will be made as per the regulations of the University and GO.Ms.No.346 HM & FW (R2) Dept. dated 10-12-2010 and other relevant orders issued by the Government from time to time pertaining to respective courses. 2. Candidates who fulfilled the regulations for admissions into M.D. (Ayurveda) Courses for the year 2017-18 including fulfillment of Local and Non local status as per the Presidential order and G.O.P.NO. 646, dated 10th July, 1979 are only eligible to attend counseling for exercising options for admission. The candidates who fails to fulfill the regulations need not attend the counseling though they qualified in the entrance test. 1. Admitted Card of AIAPGET – 2017. 4. All marks statements of UG Degree from 1st year to Final year. 5. Council Registration certificate from the respective State Council. 6. Compulsory rotating internship certificate mentioning date of completion of internship. 9. If the applicant is studied in two places, they should submit 6th class to Intermediate / 12th Standard and U.G. Degree course study certificate for deciding local area of the applicant. 10. If applicant has studied UG Degree course outside the state of Andhra Pradesh / Telangana, he / she shall submit the relevant certificate as per G.O.P. 646 and Presidential Order (Domicile Certificate etc..from the respective State Competent Authorities). 12. Certificate of Service particulars in case of in-service candidates issued by concerned Director. 14. Discontinuance certificates issued by the concerned Principal, if he/she is PG student. 1. The Courses at Dr. Gururaju Govt. Homoeopathic College, Gudivada are Non-Statewide. 2. Candidates who fulfilled the regulations for admissions into M.D. (Homoeo) Courses for the year 2017-18 including fulfillment of Local and Non local status as per the Presidential order and G.O.P.NO. 646, dated 10th July, 1979 are only eligible to attend counseling for exercising options for admission. The candidates who fails to fulfill the regulations need not attend the counseling though they qualified in the entrance test. 3. The In-service candidates those who are having the remaining service of a minimum of eight (8) years as on 31-07-2017 are only eligible. 4. Orders issued by the Government from time to time shall be applicable. 10. If applicant has studied BHMS Degree course outside the state of Andhra Pradesh / Telangana, he / she shall submit the relevant certificate as per G.O.P. 646 and Presidential Order (Domicile Certificate etc. from the respective State Competent Authorities). 12. Service Certificate in case of in-service candidates issued by concerned Director. 14. Discontinuance certificate issued by the concerned Principal, if he/she is PG student. For other details refer the Prospectus / Regulations 2017-18 of respective courses.